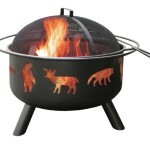 This Landmann Fire Pit features an attractive lattice pattern along the sides of its fire bowl. The Garden Lights Baton Rouge Fire Pit is supported by sturdy decorative legs and the cross weave design emits a lot of light to enhance the ambiance of your campfire experience. To protect against escaping embers your Landmann Fire Pit has a 360 degree screen lining on the inside of the fire bowl. There is also a protective spark guard for the top of your fire pit. 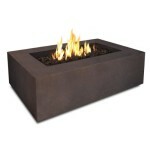 The Garden Lights Baton Rouge Fire Pit comes with an attractive Georgia clay-finish accented by black highlights and will look good on any patio or deck. There are handy decorative rings to make transporting your Landmann Fire Pit easy to do. You also get a fire poker to help you tend to your fire. Let this attractive Landmann Fire Pit with lattice cutouts warm and light up your patio get togethers.